Hard Gainer Builds Muscle and Gets Lean with Hitch Fit! 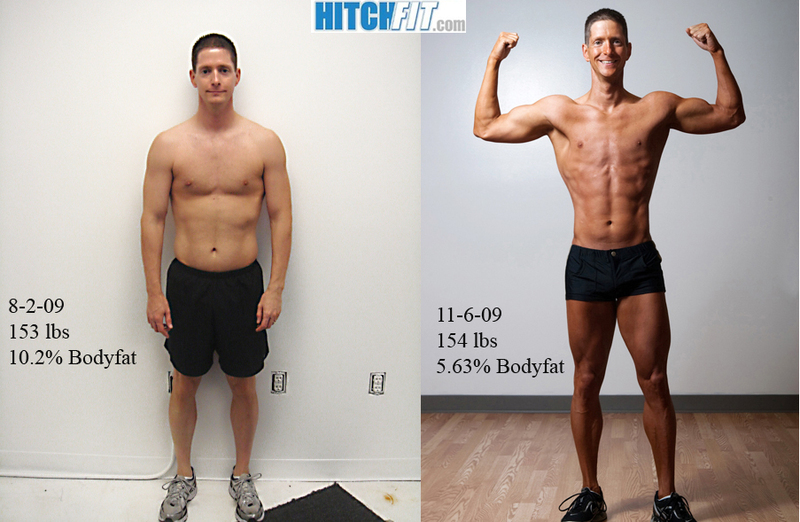 Home/Success Stories/Hard Gainer Builds Muscle and Gets Lean with Hitch Fit! Transformation by Hitch Fit Transformer Micah LaCerte! Greg Gained 9lbs of muscle and lost close to 5% body fat in 3 months.. Amazing for this hard gainer! My name is Greg, I am 32 years old, and I am a hard gainer. Roughly twelve months ago, my wife and I set on a journey to get in the best shape of our lives. I have always considered myself in good shape but it was not until someone took actual measurements and said ‘you’re border line overweight’ that it really hit me. I give credit to my wife Tami for motivating me to join a gym and do something about it. With starting a new workout routine, I had two goals in mind. First, I NEEDED functionality. I needed the performance and speed of a wide receiver. And secondly, I wanted some size. I wanted to look the part of being athletic. I’ve been trapped in a small frame for my entire life and I wanted something new. One day, I started up a conversation with a guy at the gym (Craig) who went through Micah’s program. To me Craig looked the part. Craig told me where he’d come from and I was truly amazed. However, in the back of my mind, I heard another weight loss program and I didn’t think it was for me. To me it seems there are all kinds of weight loss programs out there but are there any programs for me? After taking a look at Micah’s website and reading a bit about his training and impact he’s had on people’s lives I took a chance and emailed him and asked what could he do for me? It was refreshing to hear that he too was a hard gainer. So after some thought, I accepted Micah’s challenge. Up front, he made sure I was clear on the understanding that this was by no means a diet but rather a lifestyle change. I said ‘bring it!’. Make sure to watch Gregs Video LIVE at his shoot!!! I will admit, I had butterflies in my stomach the first day. It was either the excitement of starting a program that had the potential to transform my life or just fear of failing to meet the expectations and passing out on the first day. I will tell anyone straight up that Micah knows what he is doing. No matter what muscle group you were working that day, Micah knew just the right intensity and combination of exercises to tear you down. For a hard gainer that is exactly what I needed. You have to tear down in order to build back up. I found myself pushing to extremes and then some that I didn’t know was possible. And the best part was… I would get there every workout!!! I loved it! I physically felt like I had a workout. Sometimes on the drive home I prayed my legs would function well enough so I could use the gas and brake pedals. I kid you not, I went away every Friday with my legs blitzed. Micah is equipped with the tools in his arsenal to transform your body. He also lives what he preaches. Micah has lived the experiences and proved why they do and don’t work. That is why he is so good at what he does. There is one aspect of the program that is overlooked by so many. It is nutrition. First, I didn’t realize how much the food I put in my mouth affected my workout as well as my results. If I didn’t have the fuel to perform, my body would begin to tire quicker than if I had eaten correctly for the day. Secondly, I didn’t realize the types of foods also affected my results. Micah explained how much, when, and what to eat in order to maximize my returns. I am a believer!!! It didn’t matter how much weight I threw up on the bench, if I wasn’t eating right… my workout was for nothing. Such a small aspect of the total picture but boy did it make a difference. And one of the greatest parts about the program is Micah. He is an awesome trainer and friend. He works with you every step of the way and he will definitely challenge you to be the best that you can be. You get to a point where you don’t want to let him down. You’re doing the program for yourself but knowing you are but clay in a sculptor’s hands you want to make him proud. In addition, his and Diana’s choices speak for how they live their lives. You learn that anger and rage isn’t the means in which to achieve greatness but rather patience and hard work. Each choice you make has a way of coming back around. The experience has transformed my life. Every day I get up knowing that I’ve added years back to my life. I can perform at levels today that I never thought possible. I want to thank Micah for showing me the way. I feel awesome, look awesome and I love it! Take it from me, you CAN do it only if you WANT it. If you’re ready to be transformed, call Micah. Ready to start your transformation with Kansas City Personal Trainer and Hitch Fit Transformer Micah LaCerte? Visit www.HitchFit.com for Online Personal Training Options! If you would like to work with a Hitch Fit Trainer in Kansas City call 816-753-8900 or write to [email protected] for details.